The pagoda alone is chock-full of gold elements paired with red. These two colors are repeated in the bridge at the back corner of the block. The rock work landscape along the base of the lower level provides the perfect foundation for the pagoda. Also, the lower level features a consistent sand green support for the upper level that continues the theme of attention to details. 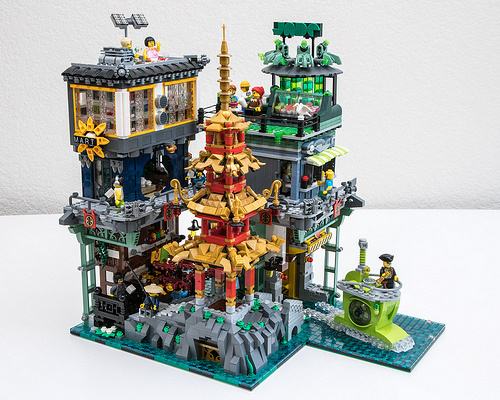 A flower stand and a submarine garage round out the lower level, complete with a submarine heading out to search the waterways of Ninjago City for sunken treasures. Moving up to the next level, a teashop, marine supply shop, and a sushi bar in varied shades of blue are complemented by simply decorated sidewalks. The absence of multi-colored advertisements found in the official sets is a breath of fresh air in this restful corner of the city. As we move to the top level, the convenience market has a fully detailed interior, and the rooftop pastry shop and patio is a perfect place to relax and enjoy the view. I’m exited you’re going to do a Wrap-up. I got to the con but the display was so crowded that I saw it between people’s shoulders. 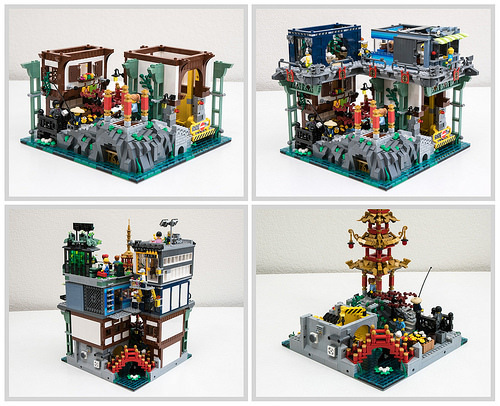 I’d love a better look at some of the amazing and colorful builds.